Welcome back to an original aBlogtoWatch feature, “My First Grail Watch.” In this series, we ask prominent people in the watch industry about the first timepiece that they lusted after. Today, we’re speaking with one of our own writers, James Lamdin. Along with writing about watches, he’s also the founder and CEO of analog/shift, and he’s painted us a rather vivid picture of his own grail hunt. James Lamdin: I am James Lamdin, and in addition to my freelance writing for ABTW and other outlets, I am the founder and CEO of analog/shift, an online boutique with a curated selection of vintage timepieces. In other words, I work on both sides of the timepiece industry, covering new watches and current events while wearing my writer’s cap, as well as buying, selling, and brokering vintage wrist and pocket watches for individual and corporate clients. In many ways, I get the best of both worlds, and should it ever stop being fun, I’ll stop doing it! James Lamdin: As with most boys, I was into gadgets from a young age, and watches were no exception. I actually remember my first watch, a yellow plastic job I got in the mail from National Geographic Junior Explorers, or some such thing. It had a blue strap and a push-button activated backlight. If memory serves, it didn’t make it through its first bath. I remained interested in but ignorant about watches through college, and had a wide variety of digital quartz and analog pieces along the way. The tipping point for me from general appreciation to outright obsession was my grandfather’s passing. He had been a man of excellent taste with a penchant for history and craftsmanship, and had built a small but respectable collection of timepieces, which were distributed to the men in my family. Although I didn’t end up with one of “the good ones,” I began studying his life in earnest through his collections of fine things, and naturally, his watches held the biggest draw. In short order, I unwittingly became infatuated with vintage timepieces, and started off a ten-year collecting hobby that ultimately encouraged me to quit my “real” job and landed me in the professional realm. James Lamdin: The original DOXA Sub 300 Professional. ABTW: What drew you to this particular watch? James Lamdin: As I was drawn into the world of vintage timepieces as a self-educating student and beginning amateur collector, I made the conscious decision that there should be a starting direction for my habit. 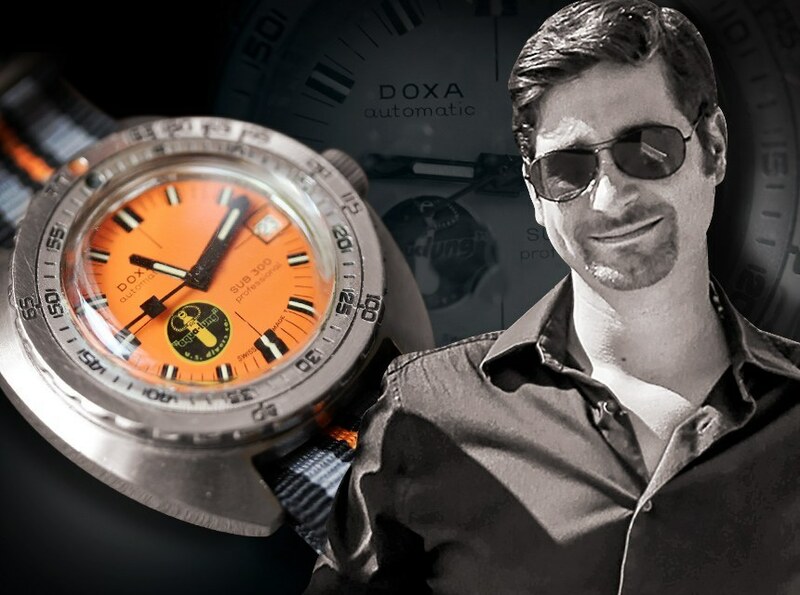 A lover of all things secret-agent (as so many of us are), I was naturally drawn to divers’ watches, and was particularly smitten with the original orange-faced DOXA I had been reading about for years in the pages of my favorite escapist fiction novels by Clive Cussler. 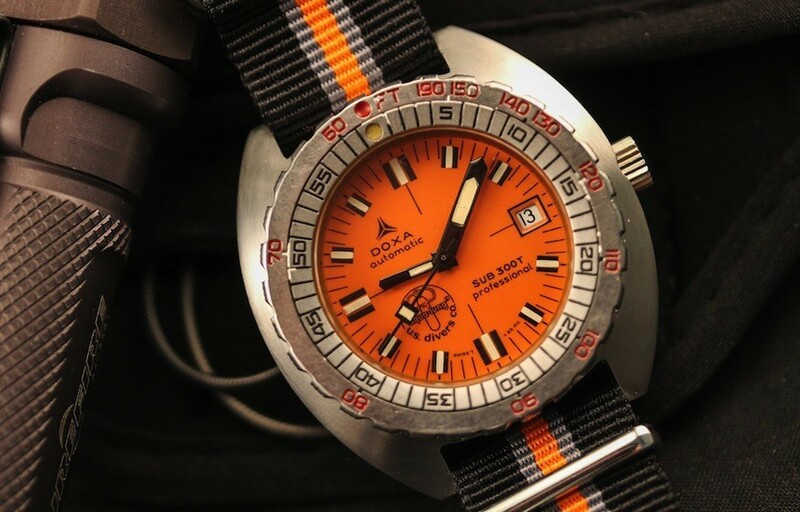 Cussler’s hero, Dirk Pitt, wears an orange DOXA in many of his stories, mimicking Cussler’s own wrist-wear, a piece he had been gifted while working at a Dive Shop in California in the 1970s, before starting his career as a best-selling novelist. In addition to the fact that my literary hero wore the watch, I was also enthralled by how little information was available about the brand and the watch at that time – with a few notable exceptions, there was virtually no information available about them for public consumption. And in terms of actually finding one? Forget it. Most of the forums, and even eBay, were in their infancy, and finding one for sale was damn near impossible. This, of course, only added fuel to the fire, and made it completely irresistible to me. In retrospect, I am blown away that I was first drawn to a watch that I hadn’t even seen, I had only read about; in fact, when I started looking for one, I had no idea what it looked like at all, beyond the brief mention of an “orange face” in a few of Cussler’s books. When I did finally lay my eyes (and subsequently, hands) on one, it did not disappoint, and to this day, I believe they are one of the most historically important and under-appreciated timepieces in the world of sports watches. ABTW: This watch obviously occupied a lot of your focus, sight-unseen. Did you ever get it? James Lamdin: It took me about three years from the time I first identified the DOXA Sub 300 Professional as my grail to the moment I got my first one. A watchmaker I knew had been cobbling one together, and even though it wasn’t original, I wanted it desperately and finally managed to pry it out of his hands. But after I had it, my love for the DOXA story continued to grow, and deep down, I knew that because my piece wasn’t a true original, it couldn’t be “the one” for me, and it was eventually traded for something else. 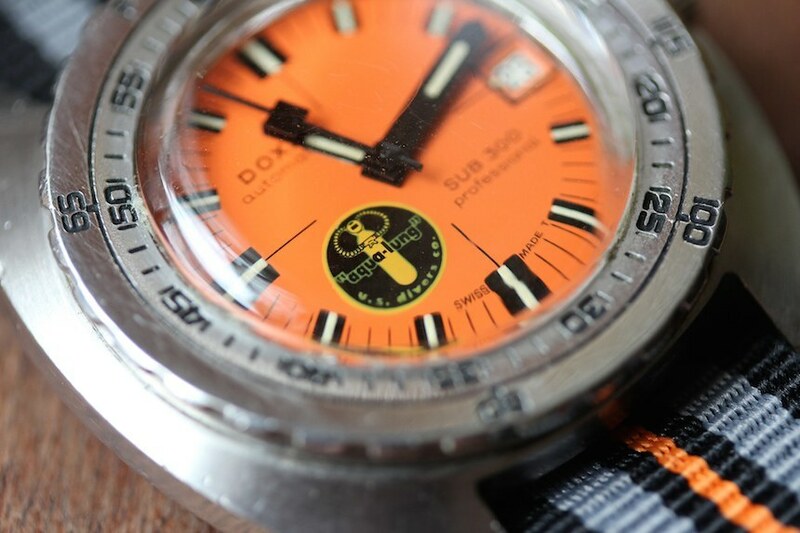 Many years later, after launching analog/shift, I was contacted by a man in California who had found a DOXA that had been sitting in his desk drawer since the mid 1970s. He had found my name through an article by Christie’s I had been quoted in about DOXA divers, and he reached out to me for some more information on his watch. It turned out he had been gifted the watch by his father, who bought it new from a dive shop in Florida in 1968. Of particular interest to me was that the watch he had been given was a very early execution thin-cased DOXA Sub 300 with a prototype US Divers/Aqualung dial. These pieces are incredibly rare, with only 15-20 known to have been produced, and are one of the most desirable models to the small but committed group of DOXA collectors. Furthermore, it was in incredible condition, and I could feel it calling to me from across the country. Needless to say, a deal was struck, and about a decade after I started my hunt for the perfect DOXA Sub 300 Professional, I finally had it on my wrist. It is continually shocking to me that after all the time I spent searching for my grail and never finding it, in the end it (literally) found me. ABTW: Do you still have it? James Lamdin: Oh yes, the “Black Lung” is definitely part of the permanent collection! Of course, a perk of working in the industry (and just being a watch nut in general) is a constant exposure to some of the coolest watches on the planet. Between that and my ever-expanding interest in different sub-categories within the worlds of vintage and modern timepieces, I have identified and began hunting several more grails along the way. I won’t give them all away, but there is a particular Genta-penned masterwork from the early 1970s which has been haunting my dreams these past few years, and the 1978 Tudor Monte Carlo Chronograph I have on my wrist as I write this (on loan from a friend) is positively drool-inducing. I’m not sure I’m going to give it back to him. I have also developed an intense appreciation and affection for A. Lange & Söhne, which is chronicled ad nauseum on these very pages. As a general rule, I am never completely won over by modern timepieces; I can appreciate them, sure – I can even find them highly desirable and enjoy wearing them. But in my personal world, a watch needs an indefinable “X-Factor” that pushes it over the edge from the realm of mere desirability and into the “Grail Quality/Can’t-Live-Without-It” category. Given my affection for the past, that X-Factor most often comes in the form of age and history, little things that make normal pieces the stuff of legend. Finding a modern piece, such as Lange’s Saxonia Annual Calendar, that speaks to me on that level right off the shelf is exhilarating. To a curmudgeonly watch collector like me, it also means that there are some truly exciting things happening in the timepiece industry, and that now might be a better time than ever to be a watch enthusiast and start on your very own grail hunt.